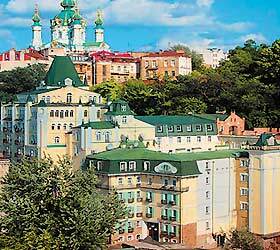 The Vozdvyzhensky Hotel is located in one of the oldest streets of Kyiv, not far from the famous Andriyivsky descent. The hotel is situated close to the city centre, 42 km away from Boryspil International Airport. There are 34 comfortable rooms of different categories in the hotel. Every room features air-conditioning, a minibar, satellite TV, a telephone with international and interurban communication, Internet access, a hair-dryer. The conference hall is outfitted with up-to-date equipment and accommodates up to 100 people. The Terrace restaurant's cuisine is distinguished by a rich choice of European and Ukrainian dishes, a fine wine collection, an assortment of spirits, cocktails, fruit and vegetable freshes. The hotel also has a lobby bar. The following hotel services are also at guests' disposal: parking, laundry and dry-cleaning services, air and railway tickets booking, newspaper service.